high school senior and student athlete who has travelled to Africa every summer where he has learned the importance of preserving and protecting nature. The youngest of four children, Jack has just published a inspiring new children’s book from Peek-a-boo Publishing that helps raise awareness and educate children and their parents about the importance of saving Black Rhinos. Jack recently appeared at a fun filled family event held at the beautiful Carlton Hotel in New York City to celebrate the launch of Chizi’s Tale. Based in Zimbabwe, Chizi’s Tale is the true story of a day-old black rhino that was separated from its mother. Upon discovery by two park rangers, the park manager is informed immediately and ultimately takes the rhino home to his family. The family adopts the infant animal and names him Chisiwana, which means ‘Orphaned One’ in the native language. Nicknamed ‘Chizi,’ the book chronicles his first year at his new home, where he is treated like a beloved family pet. Today, black rhinos remain critically endangered due to the rising demand for rhino horn, which has brought poaching to record levels. Native to eastern and central Africa which includes the countries of Kenya, Tanzania, Cameroon, South Africa, Namibia, Zimbabwe, and Angola, there are approximately only 4,800 remaining in the wild. Through the kindness and perseverance of his adoptive family, Chizi is working to slowly be released back into the wild as it is vital towards helping his species survive. Both hardcopy ($7.99) and paperback ($3.99) versions of the book will be released simultaneously. Chizi’s story is appropriate for children ages 0 to 8, though he will touch the heart of all! Jacqui Taylor lives in Zimbabwe. She wrote and illustrated A Hong Kong ABC, An African ABC, A Baobab is Big, and The Queen of Green. To learn more, please visit her website at . Sometimes my two favorite pastimes, books and TV collide and when they do, it’s pretty incredible. This Wednesday, March 18, I’m going to get the chance to host a twitter chat with author Alice Hoffman whose New York Times bestseller “The Dovekeepers” will debut on the CBS Television Network as a four hour event series on March 31 and April 1 (9:00-11:00 PM, ET/PT). Join us from 7-8pm ET for an exclusive conversation with Alice Hoffman on Twitter. Hoffman (@TheDovekeepers) will share the behind the scenes story behind her incredibly moving novel and the making of this epic television event. Plus, if you tweet along, you’ll instantly be entered to win an autographed copy of “The Dovekeepers.” Six winners will be selected at random immediately following the chat. Make sure to follow the Twitter handles and hashtag below and we look forward to a really special author experience. Join the Twitter party and you’ll be eligible to win an autographed copy of “The Dovekeepers” by Alice Hoffman. Winners will be notified after the chat via Twitter. Set in ancient Israel, THE DOVEKEEPERS is based on the true events at Masada in 70 C.E. After being forced out of their home in Jerusalem by the Romans, 900 Jews were ensconced in a fortress at Masada, a mountain in the Judean desert. Besieged at Masada, the Jews held out for months against the vast Roman armies. The project will recount the events from the perspective of a few extraordinary women who arrive at Masada with unique backstories, but a common bond for survival. Additionally, these women, who work together daily as dovekeepers, are all concealing substantial secrets. Disclosure: This Twitter TV and author event is sponsored by CBS. Over the past year, I’ve put on a few extra pounds and have been a bit depressed. After trying every diet on the planet — from Jenny Craig, to Weight Watchers, to a juice cleanse, I really never understood why I couldn’t just exercise and eat sensible meals and stay at a weight where I feel comfortable about my arms, my legs and everything in between. But alas, no matter what I do, I typically lose weight, keep it off for a few months and then I return right back where I started from with a few extra pounds added to my 5 foot 1 frame. After my latest diet and exercise debacle, I watched the documentary “FED UP.” The film, by Stephanie Soechtig, is narrated by television news and talk veteran Katie Couric who serves as one of the executive producers. Opening nationwide May 9, “FED UP” shares the stories of several children and their families who are grossly overweight. The reason? They’ve been eating processed foods at home gorging on calorie laden meals at school and snacking on items that are just plain bad for them. “FED UP” also shares how the low-fat craze that started in the early 1980’s has pretty much sabotaged our eating habits. Personally, I have fallen victim to low-fat eating, purchasing low fat or no fat items for more than three decades and it has not helped in my quest to remain at a normal weight. In fact, after a certain point, I’ve struggled to lose weight because I had been clogging up my system with foods that are just not real. When you are young, you don’t think these foods will do anything to you, but lately, I’m concerned. I’ve been having lots of leg and knee issues and even see a build up of fluid in my calves. I’m seeking medical attention to make sure it’s nothing serious, but for now, I’ve decided to take my life back by finally eating right. In “FED UP,” you will learn a great deal about what foods are doing us in and the #1 culprit is sugar. Something I never realized is that as a woman, I’m only supposed to have 4 teaspoons of sugar per day. There are 4 grams of sugar in 1 teaspoon — which means that if you have low fat salad dressing or coffee with sugar, you can easily hit your allotment of sugar instantly. And if you start your morning cereal – like Honey Nut Cheerios, you will instantly sabotage your sugar goal for the day. If you decide to throw in a sweetener, well, that’s not good for you either. That will only make you want to crave sweets even more. 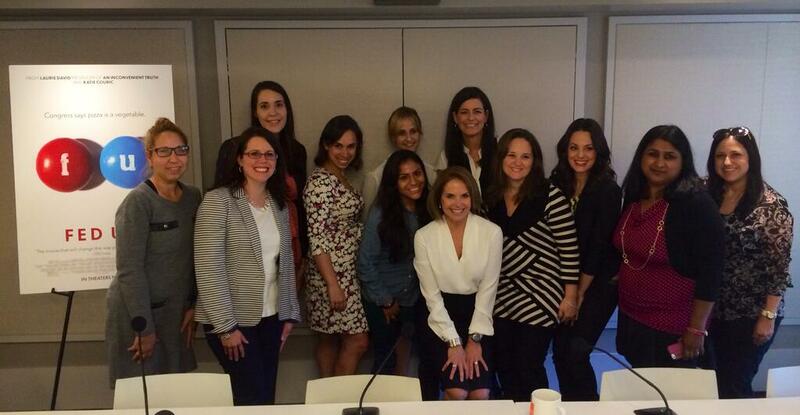 While attending a press session and for the film, I listened in as Katie Couric shared her personal experience with the food industry and admitted that she too fell for the low fat craze and remembers being excited that she could finally eat Snack Wells since they promised to be lower in fat. Unfortunately, it was high in sugar. Today, Katie says she still has trouble ditching her sweetener for good but she has switched to Shredded Wheat (which has no sugar) and tries to eat all natural foods but still uses sweetener from time to time. 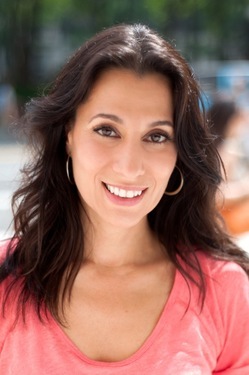 Laurie David, who is also an executive producer of the film also shared her family’s transition to natural foods and cooking and said she wishes she could take back every chicken nugget and french fry she fed her kids as they were growing up. She also talked about how the subjects in the film have found it so hard to lose weight because they live in a “Fast Food Desert,” the food in their homes is processed and the food in their school cafeteria is high in calories and doesn’t offer nutritious alternatives. Make sure you follow @FedUpMovie on Twitter and to find a theater near you playing the film, visit their official website. I was 29 years old the first time I tried mac and cheese. It happened in the cafeteria at CBS News headquarters in New York where I was a producer in the local newsroom. The salad bar was typically more my speed, but that day, as I gave a passing glanced at the breadcrumb crusted lunch special, I mentioned to a colleague that I had never tried the all American staple. She nearly dropped her tray. And you call yourself American? She shook her head and waved a forkful of the orange hued elbows towards me. Yes, I am proudly American, and who, despite my colleague’s disbelief, was raised neither under a rock nor in a cave, but in the New York City suburbs. It was however a Greek immigrant suburban home, dominated by very Greek values on life, culture, heritage, morality and of course, food. Did I mention that I’m Greek? Ours was not a home where you would find boxed mac and cheese or boxed anything for that matter. In my mother’s kitchen we feasted on her meticulously made Pastichio. Much like its American cousin, mac and cheese, Pastichio is considered the ultimate in Greek comfort food. It’s a trifecta of flavors; buttery noodles topped with savory tomato meat sauce infused with cinnamon topped by a crowning layer of cloudlike béchamel cheese sauce hidden beneath a crispy brown crust of baked cheesy goodness. You can’t get that in a box. Growing up in that My Big Fat Greek Wedding kind of way, my mother couldn’t pronounce fluffernutter, let alone make one, a bowl of soup never required a can opener and I was never treated to rice crispy treats. In our home we made baklava, buttering and layering each delicate sheet of filo one by one and getting down on our knees to smash the hand cracked walnuts in a dishtowel against the floor with our hands , the way my mother’s mother, and her mother had done back in their mountain top Greek village home. As a kid, I never had any interest in these dishes, making them, learning about them and for the most part even eating them. But even so, I was made to sit and watch, and despite my protests, occasionally to help. I wanted to be anywhere but in that kitchen. I wanted my food to be as crust-less wonder bread white and homogenized as I so desperately wanted to be as I clipped a clothes pin to my nose night after willing it to transform to the enviable all American button nose of my best friend. But living under my parent’s roof that was impossibility, because after all – we, my nose, and our food, were Greek. I was 21 when I first began to cook for myself. I was saving money for a trip to Paris with my best girlfriends and cooking, instead of ordering take out seemed the perfect way to fund the trip. As I shopped for groceries and prepared my meals, I surprisingly gravitated not to the boxes and cans that I had coveted in my youth, but to the fresh ingredients and flavors that my own mother had favored. When I wanted soup, I bypassed the Campbell’s and instead bought a fresh chicken which simmered for hours with onions, carrots, and celery and bay leaves, like my mother had done. When I wanted roasted chicken, I bypassed the rotisserie birds. Instead I marinated and broiled the meat in oil, lemon, fresh garlic, salt and fragrant oregano, which I had picked and shredded myself at my grandmother’s home when I visited each summer, like my mother had done. As much as I had tried to escape my mother’s kitchen, claiming I could care less about her cooking lessons, a culinary osmosis had been taking place all along. I saved $500 that month, enough for a week’s worth of wine and baguettes in Paris. But I also saved something else that as I cooked every meal in that tiny kitchen of my first apartment; my cultural identity. I finally realized then what my mother had done with her insistence of the ingredients, foods and recipes of her own childhood. Those flavors, those smells, dishes and yes, even technique (just try telling your friends to smash walnuts on the floor when a perfectly good Cuisinart sits on the counter) transported her, and eventually me, back to that beautiful mountain village and to her own mother’s kitchen. These foods and flavors were not meant to separate me from my American life, they were a simply conduit to my Greek life. They were a reminder of the selfless women, like my grandmother, who had encouraged my mother to leave their tiny village and seek a better life in America so that I, as an “Amerikanida” could have opportunities she could never even dream of. These meals were a reminder of the women, like my grandmother, who has no material possessions to speak of, but poured everything they had, every dream, every prayer, every ounce of love, into cooking for the ones they loved – no matter how meager the pantry. Today, I’m 45 years old. I am my mother’s daughter. At the first sniffle or cough from my children, I’ll make a steaming pot of soup from scratch. I season pretty much everything with the large jar of oregano that my children shredded one summer afternoon under the watchful eye of my grandmother right after she taught them how to smash walnuts on the floor of her Greek village home. My own daughter, Christiana, is now 12. Her favorite food is mac and cheese, which she is constantly asking me to make. Sometimes I give in, usually I don’t. I prefer Pastichio. 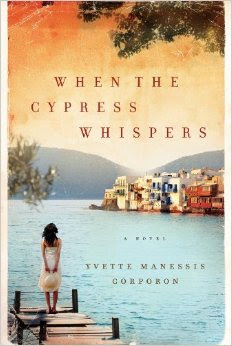 When the Cypress Whispers is the story of a young woman named Daphne and the deep and magical bond she shares with her Greek grandmother, her Yia-yia. It’s based on Yvette’s family and takes place on the magical Greek island that they still call home. 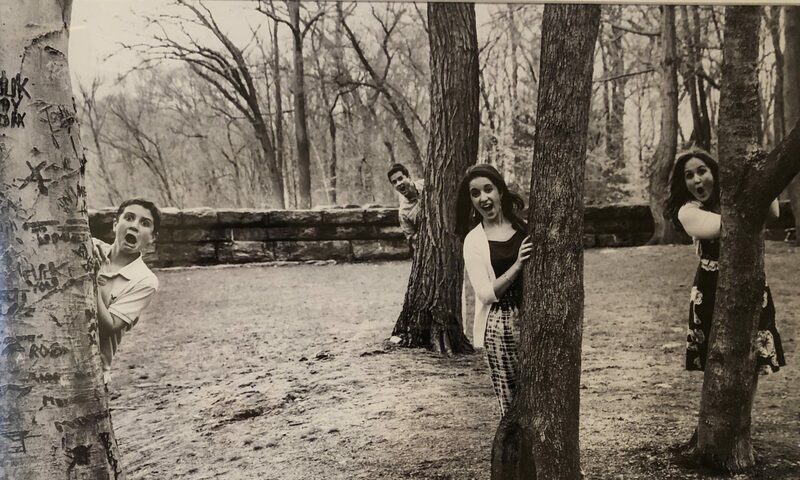 She grew up listening to her own Yia-yia’s stories of life on the island and how as a young mother she befriended a Jewish Girl named Rosa whose family was hiding from the Nazis. Despite the risk to themselves and their families, not one person on their island gave up the secret of Rosa’s family – and they were saved. Even though the Nazis had said that anyone found hiding Jews would be killed, along with their entire families, night after night her grandmother would throw open the doors to our home to welcome Rosa inside. It is their stories which resonate in Yvette’s heart and on the pages of this book. You can purchase your own copy of the book from Amazon here and click here to watch the trailer. Written by Role Mommy contributor, Danielle Feigenbaum. Cut back on all the gear and boost your baby’s development with more than 100 time-tested activities. 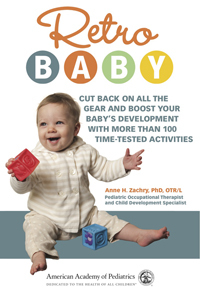 The new book, Retro Baby written by Anne H. Zachry, PHD, OTR/L, is released by the American Academy of Pediatrics. This book is intended to help parents and caregivers understand the importance of one-on-one play with children during the early stages of life. With over 20 years experience, Zachry understands that each family and baby have different needs and in her book, she offers many flexible strategies and suggestions for playtime that provide lots of opportunities to spend valuable time with baby, creating that special bond that will last a lifetime. -Learn how crucial connections are formed between a child’s brain and muscles during the first year of life. -Discover how the over use of some products can hinder infant exploration. -Observe how good old-fashioned play affects your baby’s development in a positive way. -Try a variety of ideas that enhance baby’s ability to learn. -See how to make traditional, handmade toys using common household items. Retro Baby also includes chapters on keeping your sleeping baby safe, practicing tummy time and preventing positional skull deformities. It’s only been six years since my little one was a baby and there are so many new “things” out there claiming to be good for child’s development. I love the idea that you don’t need all the bells and whistles, that just playing with and using things around your house are great for their development. The book even has words to some nursery rhymes you can sing to your baby, so sweet! I was just watching old videos of my kids and they were so smiley when I sang “If you’re happy and you know it” or “Open shut them” etc. There are also chapters on enhancing development with retro activities split up into 2-3 month intervals. This book will make a fabulous baby shower gift, everyone with a baby should have one! Retro Baby is available now through Amazon, Barnes and Nobles, and bookstores nationwide. You’ve heard it over and over. If you’re like me, you’ve probably even found yourself saying it from time to time. It’s a refrain that just about any children living today have heard from their parents: “Make good choices!” It’s usually accompanied by a smile or assertive nod as the children rush out the door to catch the school bus or participate in any activity that will not involve the parents’ supervision. And, just about every time, it’s useless advice. Why? Because most parents, while recognizing that it is critically important that their children make good choices, have failed to actually teach their children how to make good choices. Think about it this way–if you tell your children to make good choices without having shaped their thinking in a way that allows them to differentiate good choices from bad choices, it’s really no different than telling them to flip a coin and get heads every time! Now, the question becomes…how do we teach our children to make good choices? And the answer? By teaching them how to think–not what to think. Teaching kids what to think is what I like to call “Because I Said So” parenting. Instead of taking five minutes to explain the thought process behind what we’re telling our children, we so often deliver that classic line we all heard yelled from the front seat during road trips as children. And while it’s true that kids should not question their parents’ authority, it’s also true that if the thinking behind that authority is never explained to them, they will adopt new ways of thinking as soon as that authority is lifted. Andy Andrews is a New York Times best-selling author and speaker. 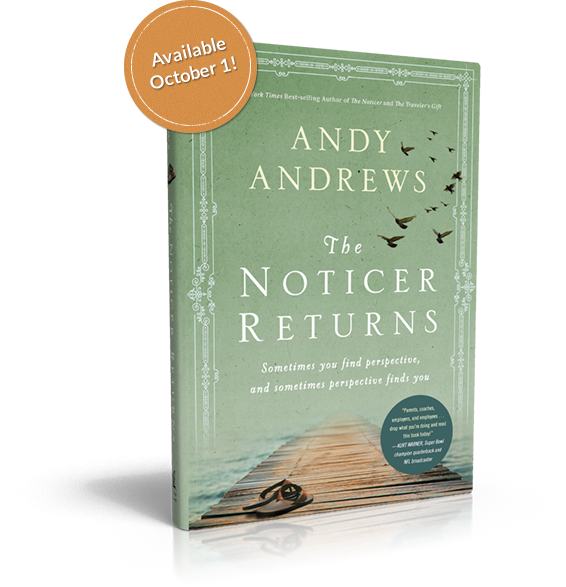 His latest book, The Noticer Returns, is designed to teach parents how to raise children that will influence the next three generations. 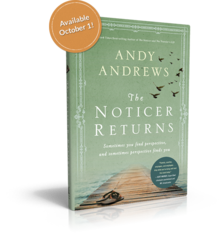 Read a free chapter of the book at TheNoticerReturns.com. Check out Role Mommy correspondent on the set of Nicholas Spark’s new movie Safe Haven. Much more to come! There is nothing that quite compares to a New England summer vacation and over the next month, my family is going to be cruising through Connecticut, Rhode Island, Cape Cod and Nantucket. While I can’t wait to relax at the beach, shop at a few farmer’s markets and enjoy a blueberry mojito while watching the sunset, what I love most about vacations is getting the chance to dive into a great summer read. If you’re going away for a quick weekend getaway or hopping on a plane for a week long adventure, make sure you download these books or go old school and pick up a hard copy! Thanks to Amazon for all the incredible descriptions below that caused me to order all these books in time for our vacation! 1. Jennifer Weiner’s The Next Best Thing – Can’t wait to dive into this delicious new novel by New York Times bestselling author, Jennifer Weiner. At twenty-three, Ruth Saunders left her childhood home in Massachusetts and headed west with her seventy-year-old grandma in tow, hoping to make it as a screenwriter. Six years later, she hits the jackpot when she gets The Call: the sitcom she wrote, The Next Best Thing, has gotten the green light, and Ruthie’s going to be the showrunner. But her dreams of Hollywood happiness are threatened by demanding actors, number-crunching executives, an unrequited crush on her boss, and her grandmother’s impending nuptials. 2. Seating Arrangements by Maggie Shipstead. Winn Van Meter is heading for his family’s retreat on the pristine New England island of Waskeke. Normally a haven of calm, for the next three days this sanctuary will be overrun by tipsy revelers as Winn prepares for the marriage of his daughter Daphne to the affable young scion Greyson Duff. Winn’s wife, Biddy, has planned the wedding with military precision, but arrangements are sideswept by a storm of salacious misbehavior and intractable lust: Daphne’s sister, Livia, who has recently had her heart broken by Teddy Fenn, the son of her father’s oldest rival, is an eager target for the seductive wiles of Greyson’s best man; Winn, instead of reveling in his patriarchal duties, is tormented by his long-standing crush on Daphne’s beguiling bridesmaid Agatha; and the bride and groom find themselves presiding over a spectacle of misplaced desire, marital infidelity, and monumental loss of faith in the rituals of American life. 3. Summerland: A Novel – A warm June evening, a local tradition: the students of Nantucket High have gathered for a bonfire on the beach. But what begins as a graduation night celebration ends in tragedy after a horrible car crash leaves the driver of the car, Penny Alistair, dead, and her twin brother in a coma. The other passengers, Penny’s boyfriend Jake and her friend Demeter, are physically unhurt – but the emotional damage is overwhelming, and questions linger about what happened before Penny took the wheel. As summer unfolds, startling truths are revealed about the survivors and their parents – secrets kept, promises broken, hearts betrayed. Elin Hilderbrand explores the power of community, family, and honesty, and proves that even from the ashes of sorrow, new love can still take flight. 4. Gone Girl by Gillian Flynn With her razor-sharp writing and trademark psychological insight, Gillian Flynn delivers a fast-paced, devilishly dark, and ingeniously plotted thriller that confirms her status as one of the hottest writers around. On a warm summer morning in North Carthage, Missouri, it is Nick and Amy Dunne’s fifth wedding anniversary. Presents are being wrapped and reservations are being made when Nick’s clever and beautiful wife disappears from their rented McMansion on the Mississippi River. Husband-of-the-Year Nick isn’t doing himself any favors with cringe-worthy daydreams about the slope and shape of his wife’s head, but passages from Amy’s diary reveal the alpha-girl perfectionist could have put anyone dangerously on edge. Under mounting pressure from the police and the media–as well as Amy’s fiercely doting parents–the town golden boy parades an endless series of lies, deceits, and inappropriate behavior. Nick is oddly evasive, and he’s definitely bitter–but is he really a killer? 5. Beautiful Ruins by Jess Walter. Nothing like a story set in Italy to give you the ultimate summer reading escape. The story begins in 1962. On a rocky patch of the sun-drenched Italian coastline, a young innkeeper, chest-deep in daydreams, looks out over the incandescent waters of the Ligurian Sea and spies an apparition: a tall, thin woman, a vision in white, approaching him on a boat. She is an actress, he soon learns, an American starlet, and she is dying. The story begins again in present time, half a world away, when an elderly Italian man shows up on a movie studio’s back lot–searching for the mysterious woman he last saw at his hotel decades earlier. What unfolds is a dazzling, yet deeply human, roller coaster of a novel, spanning fifty years and nearly as many lives. Got a must read book you’d like to recommend? We’d love to hear about it! As many of our readers know, I am obsessed with weight loss and this year, I’ve thankfully been on the losing side for a change. But no matter how much weight I shed, I happen to have an obsession about my thick thighs and large calves. That’s why when I received a copy of Six Weeks to OMG and was let in on a secret to getting thinner legs without going under the knife…I was totally intrigued. * Submerge yourself in a cold bath every day and your thighs could get thinner! Curious to learn more about this new book that promises to help you get the body you’ve always dreamed of? Well take a look at the Q&A we have with Venice Fulton and then check out the Six Weeks to OMG Facebook page where you can download an excerpt. Question: Venice, I want to get skinny but do I have to do everything in the book? Venice: No, because even if you use one thing, you’ll still outrun the couch potatoes! Before I wrote Six Weeks To OMG, everyone told me how bad they felt after giving up diets that they couldn’t stick to. The authors of those books claim that sticking to everything is crucial. These scare tactics don’t work in the real world because humans have such varied lifestyles. Also, it’s kind of obvious that not everyone needs the same amount of help. So, I designed something that would work brilliantly as a standard plan, and would still have lots to offer those who could only apply a few techniques. This also means that at different times of the year, you’re in control of how hard you work. Question: Venice, how can skipping breakfast be good if NO ONE else recommends it? Venice: I’d ask why their non-skipping advice clearly isn’t working! Breakfast is a huge business opportunity, and the advice to eat it, starts at the corporate level. Of course, there’s no denying that we all feel hungry when we wake up. Your brain and other organs have been working hard throughout the night, and they want some payback for all their hard work. And that’s exactly why you must not give in to them! Morning gives you a once-in-a-day chance to force the body to use fat as a fuel. The moment breakfast passes your lips, it sees no reason to use stored fat. With Six Weeks To OMG you will still break (your) fast, just a little later than normal. Question: Venice, isn’t this just another paleo type diet? Venice: Six Weeks To OMG makes paleo diets extinct! The paleo principles are limited to talking about diet alone. To look fantastic, your body can’t just rely on advice about food. Cavemen and women had very different physical lifestyles to us, and a different mental outlook. On top of this, no researcher was alive back then, so there’s a hunk of guesswork going on! The best strategy is to learn from what we do know about our ancestors, and combine it with stuff they definitely didn’t have access to. Like the 21 million journals stored in the National Institutes of Health! Using a modern mix of diet, biochemistry, and psychology is definitely the way to an ultimate body. Question: Venice, will this diet work for all age group and no matter how much or how little you have to lose? Venice: Six Weeks To OMG is for anyone who needs help. Bad habits are now spreading across all age groups and even countries, so it’s smart to protect yourself with the best knowledge, whoever you are! The decision to change your life is a personal decision, or one that you can share with your doctor. The techniques in the book aren’t for any particular age group, they’re just techniques that work, period. It’s also worth pointing out that just because you’ve seen a few more summers, it doesn’t mean your body is resistant to change. With a fresh approach, all previous behaviors can be wiped out. Question: Venice, do you know for certain much can weight I really lose? Venice: If you pick up Six Weeks To OMG you’ll certainly lose more fat than if you didn’t! Seriously, I can’t give exact figures as that assumes I know how much you’ll apply the book. Plus, there are so many factors that affect success. I will say that based on experience, losing up to 20 pounds of fat is possible for most people, assuming they’ve got that much to lose. Some lose more, some lose less, but everyone will lose fat, and that’s progress in the right direction. The more important question is, ‘will the fat stay away?’. And the answer is YES! The book will make you an expert, instead of an expert just telling you what to do, without you really knowing why. So what are you waiting for? There’s still time left to slim down for the beach! 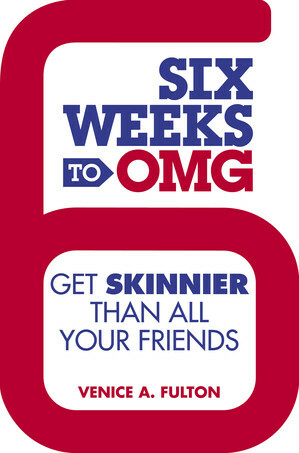 Order a copy of Six Weeks to OMG today and find out the secrets to getting skinny once and for all! Summer is here and that can only mean one thing. It’s time to start diving into some great books. Thanks to my mom, I’ve got a treasure trove to choose from and trust me when I tell you, my mother knows her books – she’s even in two book clubs – one in Florida and one in Southampton so she singlehandedly has her finger on the pulse of what’s hot among women this summer (in addition to Fifty Shades of Grey of course). The House of Tyneford by Natasha Solomons is both a love story and an historical account of the time period preceding World War II. The story begins in the spring of 1938 in Vienna, where it is no longer safe to be a Jew. Elise Landau is a 19 year old Jewish young lady living a life filled with elegant parties, champagne, and affluence. However, she is forced to leave her family and become a parlour maid in England. She arrives at Tyneford, the great house on the bay and life changes for her when Kit, the son of the master of Tyneford house comes home. It is a love story that is beautifully written filled with incredible descriptions of Tyneford that at times, have you feeling that you are actually at the house with Elise. The DoveKeepers by Alice Hoffman is another book that I strongly recommend. Once again this novel is historical fiction. Based on the historical setting of Masada when in 70 CE(common era) 900 Jews held out for months against the Roman armies. According to the historian Josephus – two women and five children survived. The story is told by four women who have you mesmerized by their stories and their ability to survive in a setting filled with terror famine and unbelieveable conditions. The author did an incredible amount of research and the story is just outstanding. Molokai by Alan Brennert is historical fiction that is an outstanding read. The story is set in Hawaii more than a century ago and it is a deeply moving novel. Rachel Kalama is diagnosed with leprosy at the age of 7. Her parents take her to a local hospital and from there she is sent to Kalaupapa – which was an actual colony for lepers on Molokai. The novel follows her life from age 7 to old age. Her resilience and will to live under incredibly difficult conditions is unbelievable. This novel will have you crying and smiling, but what will really tear at your heart is the fact that this was an actual place where individuals diagnosed with leprosy lived their lives without their families.